A little under the weather, but persevering. I have to say though, I’ve been unhappily peeking ahead a couple of hundred pages and we will still be detailing the history of Islam as a state and a religion for the next couple of hundred pages – not an especially pleasing prospect if what you’re really interested in is actual Roman history. Its good background. But for 400 pages? Gibbon’s 3rd volume is basically all non-Roman unfortunately. He spends 2,000 pages on about 350 years of history. Now he has 900 years to go. You do the math (answer: that would leave Gibbon about 5,000 pages left to write – we actually have only about 800 pages left – mucha condensacion as the Spanish would say). You can tell he is getting tired and is down to dotting his “i”s and crossing his “t”s, SLOGGING THROUGH the last 1000 years of Roman history like a man trying hurriedly to load his plate at last call at the legendary buffet at Caesar’s Palace in fabulous (literally) Las Vegas (see above image for everyday sight in the aforementioned fabled city). Gibbon just grabs what he’s interested in, or what he thinks might sell, or whatever’s nearest and easiest to grab and rushes disdainfully through the rest. He doesn’t ignore it because he’s tired of Rome, he ignores it because it’s eminently ignorable. Trust me, Gibbon says. I know what I’m doing. And we do, because he’s Gibbon and he can write like 99 demons when he sets his mind to it. Still it’s mostly “info-tainment” from here on out to the end. 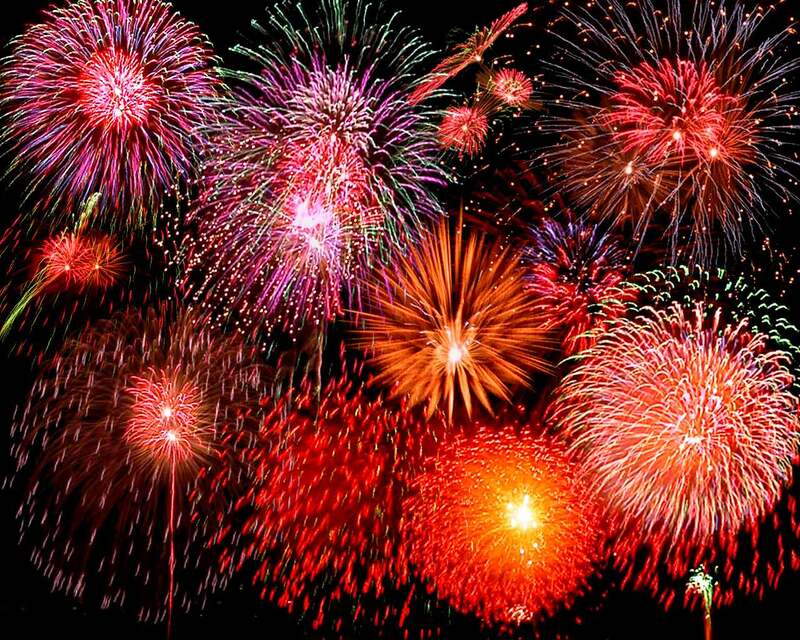 That puts us basically up against New Years before we return to what Gibbon refers to as the history of the “Greeks”. Even when he gets back to talking about Rome now, he’s not REALLY all that interested. There’s a reason why in French the “Byzantine” empire is called the Bas-Empire (low empire). For literate 18th cent. men (read Gibbon) brought up on Cicero and Ovid, Livy, Caesar and who could forget Catullus (whose name I recently realized could be understood as either clever or kitten – a very Catullan conceit), it’s all slumming as far as the eye can see from now on. The Arab stuff is undeniably interesting but not particularly Roman – except that Islam will occupy in the East (along with the Serbs and Bulgars in the West) the continuous attention of Constantinople and Rome until the 1200’s – of course in 1202 (with the 4th Crusade and what has been justly referred to as the last barbarian invasion) Constantinople becomes a little preoccupied with France, especially when the French sack and take her. I’m sure we’ll get a history of France out of Gibbon also, in 6 months or so. Until then, for the next few months we will be mired in a 1790’s view of the 630’s takeover of a desert peninsula and its society’s religious sensibilities. Again, his history is mostly interesting from a sociological/anthropological view nowadays, modern scholarship has swamped his pioneering but small Gibbonian boat of research like a tsunami falling on a sandcastle (to freely mix metaphors in the most confusing way possible). In other words, what was cutting edge in 1790, now doesn’t merit a footnote in 2012 – EXCEPT extremely ironically, in that Gibbon himself has become a primary reference for modern day socio-historians following the mentalities of English philosophes of the late Eighteenth Century. From fêted radical to hoary artifact. An evolution we all will follow should our work be so fortunate as to be read centuries from now, as Gibbon’s has . Gibbon takes a surprisingly positive view of the whole Rise-of-Islam arc of history – again, doing so in a very Gibbon-like contrarian way – partly to shock modern (18th cent.) readers to be sure, but also trying to write decent history about an entire religion that had been described with ignorance, fear and loathing mostly heretofore. For that he is to be praised. But as for Roman history – the pickings continue to be at the very least, slim. If not non-existent. But that’s my own personal gripe. Your’e probably getting tired of it. Mecca loses, men, wealth, direct trade routes to Moh. followers – 1st round of battle to Moh. 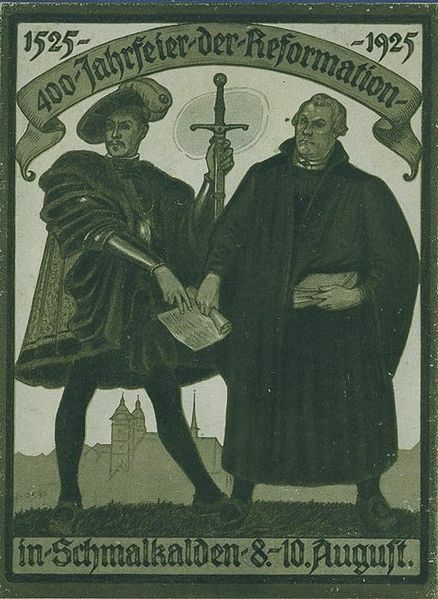 Lutherans versus Catholics – the middle and late 1500’s were one long continuous battle between rival kingdoms, economic forces, empires, small states, and yes, Protestants and Catholics. And, like the expansion of Islam, where political control and rapid conquest brought about swift changes of religion, political control dictated religious change in Sixteenth Century Europe – the Peace of Augsburg in 1555 was based upon it and it set up a dividing line between Lutherans and Catholics (Anabaptists and Calvinists were still heretics) in Germany that continued for centuries. Cuius Regio Eius Religio (literally “whose realm his religion” left the spiritual state of millions in the hands of the consciences of the individual rulers of each state. Short of emigration, your personal spiritual journey was dictated by negotiators between the Holy Roman Emperor Charles V and the German princes of the Schmalkaldic League. Rulers deciding for citizens is not new. All this is maybe something like the gradual assimilation over a decade or so, tribe by tribe rather than individual by individual, of the nations of the Arabian peninsula into Mohammed’s new unitary religious and civil state. 2) Working With The Materials You Have At Hand – Gibbon again makes his case for the rapid rise of Islamic Arab tribes by explaining that Mohammed made use of the already vigorous cultural values of raiding and pillaging your neighbor – thus the jihad was a natural extension of a reflex already deeply embedded in the Bedouin culture. You make use of what you have. Mohammed serendipitously has raiders and pillagers for co-religionists, so he uses a raiding and pillaging kind of war for the purposes of his proselytizing among the Arabs, and later the Mediterranean and Asian world. Gibbon says as a purely economic motive, embracing Mohammed’s cause was fruitful – that the passionate Bedouin would later, after signing on to Mohammed’s guerrilla bands raiding Meccan caravans, discover submission to the One God and thereby save himself eternally. This, per Gibbon, was all part and parcel of Mohammed’s plan. Realistic portrait of a Ninth Century Viking. Given a strong dose of monotheism, could another rather desolate and remote peninsula – Scandinavia – have conquered half the civilized world too? Also, Gibbon makes the interesting sociological observation that a patriarchal raiding and pillaging society would be particularly susceptible to a religion that enshrines warfare and conquest as a means to gain salvation. Like pouring rocket fuel into a VW’s combustion engine, maybe (I’m no engineer, I know, the VW’s engine would probably cough and die -but work with me on this), you get a beetle that commands a great deal of respect. Just think, if Charlemagne’s missionaries (in the late 700’s, early 800’s) had been also the leader of armies and promised salvation (and by the way, riches) to any who would join up – all of Viking Scandinavia (arctic bedouins who ingested Raiding and Pillaging with their mother’s milk) would have joyfully converted to the cause and conquered half the world before they were through. 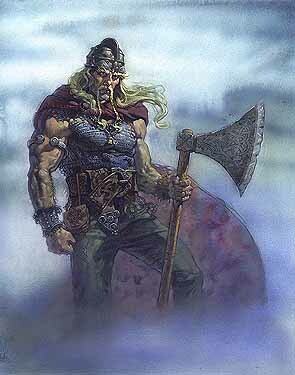 As it was they (the Vikings) took Western Western Europe, Sicily, Southern Italy and the Russias. The Arab continued to unite the professions of a merchant and a robber; and his petty excursions for the defence or the attack of a caravan insensibly prepared his troops for the conquest of Arabia. The distribution of the spoil was regulated by a divine law: the whole was faithfully collected in one common mass: a fifth of the gold and silver, the prisoners and cattle, the movables and immovables, was reserved by the prophet for pious and charitable uses; the remainder was shared in adequate portions by the soldiers who had obtained the victory or guarded the camp: the rewards of the slain devolved to their widows and orphans; and the increase of cavalry was encouraged by the allotment of a double share to the horse and to the man. From all sides the roving Arabs were allured to the standard of religion and plunder: the apostle sanctified the license of embracing the female captives as their wives or concubines, and the enjoyment of wealth and beauty was a feeble type of the joys of paradise prepared for the valiant martyrs of the faith. The intrepid souls of the Arabs were fired with enthusiasm: the picture of the invisible world was strongly painted on their imagination; and the death which they had always despised became an object of hope and desire. The Koran inculcates, in the most absolute sense, the tenets of fate and predestination, which would extinguish both industry and virtue, if the actions of man were governed by his speculative belief. Yet their influence in every age has exalted the courage of the Saracens and Turks. The first companions of Mahomet advanced to battle with a fearless confidence: there is no danger where there is no chance: they were ordained to perish in their beds; or they were safe and invulnerable amidst the darts of the enemy. Gibbon makes his own observation, as an Englishman not believing in fate or predestination particularly, that anyone who did believe it wholeheartedly would cease working and stop practicing virtue, as each man’s fate (and his salvation) would already have been written irrevocably before he was born. NOTE: Gibbon’s foray into predestination above, is of course, natural and understandable, as he lived in Switzerland (Lausanne) for quite awhile. 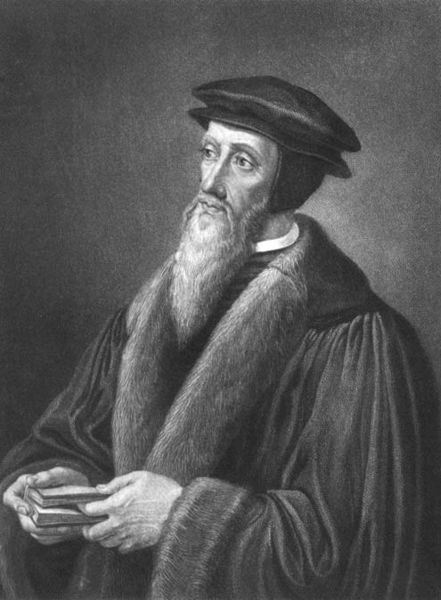 John Calvin of (Swiss) Reformed Church fame, just down the lake (Lake Geneva) in Geneva, Switzerland once debated in 1536 in Lausanne at the beginning of his career. Predestination. the idea that all events have been pre-willed by God is a strong tenet of both Islam and Calvinism. 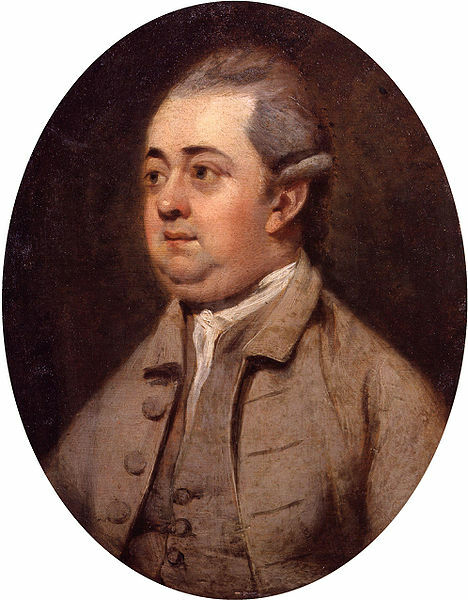 Portrait of Edward Gibbon by Henry Walton – such a gentle, kind face – who would or could guess what razor sharp wit lurked behind those placid, innocuous brows? And that we would still be talking about him 200 years later?